Career-Test.org - Take a professional Career Test. For Free. Take a Pro Career Test. For free! 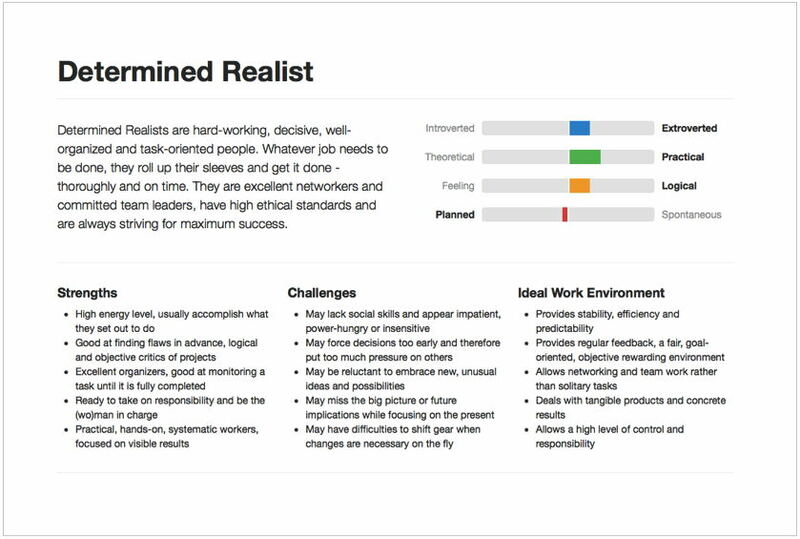 Discover your perfect career based on your personality type. In just 10 minutes. Start the Free Career Test! Just take the test providing your email address. Once you've finished the test (in about 10 minutes) the result will be sent to you immediately. Your career test result will include a detailed career type description and an analysis including your strengths, challenges and your ideal work environment. Our Career Test has been recommended as a career planning tool by numerous organizations and institutes worldwide, such as the Bavarian State Ministry of Labour (Germany), the National Health Service (United Kingdom), Manitoba Career Development, the Centre Franco-Ontarien de Ressources Pédagogiques (both Canada) and the YMCA (USA). This Career Test has been developed by Felicitas Heyne. Felicitas Heyne is a well-known psychologist and best-selling book-author. She is an International Affiliate of the American Psychological Association (APA) and Member of the German Psychological Association (BDP). Start the Free Career Test now!